A truck passing by the logponds in Labai Hilir, Ketapang, West Kalimantan. @Auriga, 2014. This report analyzes the ownership and management structures of APP’s 33 declared pulpwood suppliers in Indonesia – which control 2.6 million hectares of HTI plantation concessionsii – and of two companies that APP has recently named as prospective suppliers. The study aims to assess the degree to which current and prospective supplier companies that APP has deemed to be “independent” partners may, in fact, have links through ties of ownership or management to APP and/or the Sinar Mas Group. The analysis is based on a review of 78 companies’ official corporate registry profiles published by the Directorate General of Public Law Administration, in the Government of Indonesia’s Ministry of Law and Human Rights. These corporate registry profiles are current as of April 16, 2018. Of the 27 forest plantation companies (holding 31 HTI concession licenses) that APP has described as being “independent” partners, at least 24 companies (holding 29 HTI concession licenses) show apparent close links with the Sinar Mas Group. The 24 forest plantation companies are owned by groups of holding companies, a majority of which are or recently were registered in offices located at the same street address as the Sinar Mas Group’s corporate headquarters (Plaza BII, Jl Thamrin No 51, Central Jakarta) or at Wisma Indah Kiat, which shares an address with PT Indah Kiat Pulp & Paper Tbk, an APP paper mill in Serpong, outside of Jakarta (Jl. Raya Serpong Km 8, Serpong Utara, Tangerang, Banten). Publicly available sources, including social network profiles and media reports, indicate that many of the 24 “independent” supplier companies with apparent links to Sinar Mas also have shareholders, commissioners, and directors who appear to be current or past employees at entities affiliated with the Sinar Mas Group. The majority and minority shareholdings of these 24 supplier companies flow through 22 holding companies to eight individuals, seven of whom appear to be current or past employees of entities controlled by the Sinar Mas Group, such as Sinar Mas Forestry. Sources indicate these individuals have held positions including in the human resources department of PT Wirakarya Sakti and the finance and accounting department of PT Arara Abadi, both large HTI plantation companies that APP acknowledges it owns. Within this group of 24 “independent” suppliers, the majority and minority shareholders who are apparently linked to Sinar Mas also hold many of the director and commissioner positions in the HTI concession companies and affiliated holding companies. Of the 45 other people who hold commissioner and director positions, publicly available sources indicate that another 16 appear to be either current or past employees of entities affiliated with the Sinar Mas Group. Sources indicate these individuals have held positions including as Sinar Mas Forestry’s head of corporate tax, costing head, and director of contract management services. Five family members of Sinar Mas Group founder, Eka Tjipta Widjaja, and over 20 offshore companies are the beneficial owners of APP’s pulp and paper mills in Indonesia and of four other HTI plantation companies APP acknowledges owning (including PT Wirakarya Sakti). According to government corporate registry documents, these interests flow through PT Purinusa Ekapersada, a holding company which owns the APP brand and in which much of APP and the Sinar Mas Group’s pulp and paper holdings are consolidated. The offshore companies are incorporated in Singapore, Hong Kong, the British Virgin Islands, Mauritius, Japan, Malaysia, and the Netherlands. In a holding company structure that excludes PT Purinusa Ekapersada, the same Widjaja family members are the beneficial owners of two other HTI plantation companies that APP acknowledges owning, including PT Arara Abadi. Within the complex corporate structure of the Sinar Mas Group, it is notable that the group’s holding companies also control sizeable areas of licensed HTI concessions that have not been declared as suppliers to APP’s mills. For example, the majority ownership of PT Hutan Rindang Banua, which has an HTI concession license for 265,095 ha in South Kalimantan, flows into some of the same holding companies as APP’s “owned” HTI plantation companies and pulp and paper mills. However, PT Hutan Rindang Banua’s plantation concession is apparently not covered under APP’s Forest Conservation Policy or, at least through May 2018, under APP’s roadmap process to end its dis- association from the Forest Stewardship Council. In March 2018, President Joko Widodo issued a new regulation (Presidential Regulation 13/2018) requiring all companies in Indonesia to declare their beneficial owners within one year. Designed to curtail money laundering and terrorism financing, the new regulation on beneficial ownership promises to have significant impacts in Indonesia’s natural resource sectors by stemming the loss of tax revenue and raising corporate accountability. 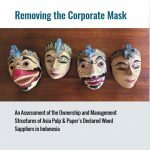 This report aims to support the Government’s efforts by tracing out the corporate network of Asia Pulp & Paper – which, until now, has largely been hidden behind a mask of corporate secrecy.